Harmonia Tactics v1.4.1 + Trailer! Before clicking the download link, check out our new trailer! Moving on… Bugfix release! A lot of crashes were fixed, some of them pretty critical. Slime Runner! didn’t even run, which was surprising, considering it was the last thing tested before the v1.4.0 release. Mysterious! Other than that, crashes should be at a minimum now, and chat in Tower War has teams properly color-coded. Additional vertical angles for Slime Runner!. Slightly harder to die in Cheesetopia. Slime Runner! runs again, derp. No more division-by-zero errors when height penalties aren’t defined. HUD no longer causes crashes, especially when quitting a game. Tower War names now properly reflect players’ teams. Scenes no longer continue playing while server is paused. Tutorial no longer hits account player limit. Harmonia Tactics: Engine Demo v1.4.0! Another release, only 2 months late – hurrah! This release features a tutorial, cutscenes, height-based gameplay, and lots of engine upgrades. The cutscenes and engine upgrades pave the way for some significant game content, which makes this release an important “bridge” to bigger and better things. Aside from a bugfix release, this is likely to be the last public release for a while. It’s time to start churning out content for the game and working on the story, artwork, maps, etc. There is still plenty to do programming-wise (the basic controls could use some improvement! ), but it’s time to move onto the next phase of development, which should be fun, if not interesting. Already featured in last week’s post, the Rollcoon is making his appearance in this scene demo. It may not look like much, but this scene plays out in real-time online, visible by other players, without interrupting gameplay of any other your characters. Neat! Again, big kudos to Detocroix for this little creature. Paradox is an experimental map designed to test height-dependent damage bonuses and movement restrictions. There two paths with one-way staircases and several high-elevation sniper points. The map is also freakin’ nuts – the entire map is visible at once for planning strategies, which can be mind-warping at times. Get ready to rotate the camera all over the place! Game renamed to ‘Harmonia Tactics’, complete with new logo! New tutorial to explain basic game concepts. Four single-player demos for new game engine features. Height is now a factor for troop movement. Attacking from high places provides a bonus. New ‘Paradox’ map added to ‘Tower War’. Hitting ‘Escape’ in-game brings up the game menu. Rewrote chat window to use a more traditional interface. Doors and context-sensitive object commands. One new spell – ‘Gust’ for Monk. ‘Slime Runner’ wasn’t working properly – now it does. Screen resolution / window size is now saved and can be modified from the options window. Hitting ‘x’ now centers the camera on the selected character. Double-clicking on characters in the HUD now centers the camera on them. Maps are more visible indoors. Enemy HUD is now in the upper-left corner rather than the lower-left. Reaching 0 respawns in Tower War results in effectively permanent death. For RPG-like mods, new accounts can be created. Server now caches object distances – it takes a healthy chunk of memory, but drastically improves CPU usage. Major upgrades to camera functionality. Dialogue improvements – it no longer steals game control. Order icons at the end of paths are now drawn correctly. HUD no longer crashes on occasion. Remade map background to tile properly. Fixed a few pathing errors. Tower War now resets the camera between rounds. The Single-Player Approach, or, That Doesn’t Work Online! "Damn! This isn't good...  if Synival himself is here, the "
This is a pretty straight-forward scene with some dialogue, camera changes, and basic blocking like “jump” and “draw_sword”. It gives you a choice to fight the pirates or return to town. In an offline mode, the game could stop time while the scene executes, then safely return your characters to their original places and start the game clock again. However, if playing online, this isn’t an option; it would be quite rude for one player to pause the entire server! Events will continue to run and outside influences could disrupt the scene. For example, the harbor could be destroyed by cannon fire. A “petrify-in-10-seconds” debuff before the scene began could kill all the characters mid-scene. And, probably most common of all, the client could disconnect at a point after the pirates spawned, but before the player chose to fight or retreat, leaving the area in an incomplete, bugged state. Harmonia lets you play as several characters at once which can be selected via the HUD or the 1 through 0 hotkeys. They can also split up and explore completely different areas of the map. Because of this, characters manage their scenes individually. If Jack is buying items at the local shopkeeper, Jill, who is regenerating HP back in the inn, may not want to be interrupted by the bartering occurring 5 buildings away. In addition, the town drunkard could interrupt Jill with some quest dialogue while she’s sitting around, which wouldn’t interrupt Jack’s shopping spree. When a character has a “Speech” icon above their head, it informs the rest of the world that they’re in a scene. In this state, they can’t be pushed, attacked, and they can’t be issued any orders until they’re out of the scene. Programming-wise, this isn’t too difficult to accomplish. Because the server-side scene object remembers its state, and because the server syncs the scene with clients, it’s easy enough to make sure clients are always looking at scene data from their current character. The client remembers its own camera state outside of the scene, so whenever it re-enters gameplay mode, it can pop the scene camera state and return to normal. Check out this cuddly li’l Rollcoon, up to some wacky antics! Assigns 'value' to 'property'. In this scene, it's changing the camera positioning. Creates or appends to a dialogue window belonging to 'character'. 'id' is a unique identifier used to keep track of which dialogue has already been read. Runs the script 'script' on 'character'. Used to modify properties of characters or issue orders like jump() or move(). Pauses execution of the scene/script until certain conditions are met, specified by 'type' and its 'parameters'. 'id', like with dialogue(), is a unique identifier used to keep track of which wait() commands have already executed. set (camera, "x=-3 y=-12 height=-1.5 rot_y=-30 rot_x=22.5 dist=5 "
dialogue (1, speaker, "What are you doing in here?! Get out of my house!" set (camera, "x=-1 y=-9 height=-1.5 rot_y=-60 rot_x=22.5 dist=8 "
narrate (2, "Wait a minute - why did HE leave? This scene makes no "
"I hope this little demo made your world a little bit "
This is a simple beat that tells the Rollcoon to move back to its spawn location further down the map – he didn’t spawn in his house 🙂 It also turns off the ‘scene_welcome_rollcoon_house’ script, which is what put him in the house in the first place. With that script gone, he returns to his original location and runs an alternate scene, specified elsewhere. This model has everything necessary to program a menu system for shopkeepers, quest characters, and any other random event. Implementing the current system took a long time, so I’m taking a break from it for now 😛 When my brain solidifies (it’s a pile of mush right now thanks to exhaustion and the common cold), that may be the next project. Harmonia v1.3.0 – 1.4.0 on the way! Greetings! I should have updated this site one month ago, but it slipped through the workload. Development has slowed down lately, mostly due to burn-out. A website staff would be nice to have! 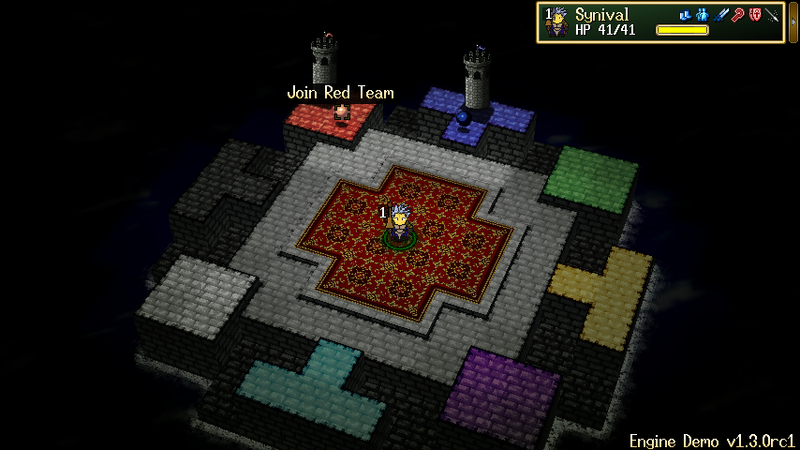 Regardless, here’s the latest version of Harmonia, with some big Tower War upgrades! * Five magic spells are in and fully usable. Hoorah! * Window now grabs mouse, allowing for mouse scrolling. * HUD windows can now be expanded/contracted to show either more character detail or more map visibility. * Stats now use a ‘Tag’ system for balance. In the HUD, rather than showing the player class, there are various icons representing bonuses (Blue) and penalties (Red) to stats. * More rendering filters for sprites, specifically for magic and lighting. * New Map ‘Cavern of Balance’ (Map #2). * Teams can be chosen when connecting. * Lots of balance changes and AI improvements. * Added more options to the ‘New Game’ window. * New players connect at the level of the weakest player so team balance doesn’t immediately shift. * Many, many bugfixes, tweaks, and performance upgrades. * Modified a lot of sprite frame details, and female sprites should look more lady-like. * Animations now have ‘Subframes’ as well as ‘Frames’ for the purpose of animations. * Sprite Editor can add (but not yet remove/copy/modify) subframes. * New ‘Tag’ system applied to Battle Arena monsters. * File Chooser dialogue now works a little better. * Game/Interface sound effects are now on separate channels. * New sound effects for user interface. * Objects can now be glued onto other objects, i.e, “attacker.*weapon.tip”. * New music track for swamp: “It Approaches”. * Tactical icon resolution upgraded. * Crossbow/Cannon now have proper arrows and animations. * Sprite textures can now be exported to PNGs using the Sprite Editor. * Explosions no longer have shadows. * Unit orders should no longer persist when the order is over. * Fixes to Windows/Linux background process launching and management. * Fixed some potentially game-stopping network bugs. * Reorganized a lot of files, which means a full update is necessary. * Sprite Editor bugfixes – it doesn’t lock up constantly anymore! * Updated artwork for the grid to be the same pixel size as common tilesets. * Render engine now uses a more advanced (and cleaner!) shader management layer. * Several server-side performance optimizations. * Textures are now sorted by name in splay trees. * Sprite limb system overhauled to be much more versatile.